Kamel Zarrouk. Photograph from Magharebia. The deputy emir of Ansar al Sharia Tunisia is reported to have left his home country and traveled to Syria to wage jihad alongside the Islamic State of Iraq and the Sham. Kamel Zarrouk, who is described by Magharebia as Ansar al Sharia Tunisia’s “second-in-command,” fled Tunisia after security forces raided the Ettawba mosque in Tunis in January. Tunisian police tried to detain Zarrouk at his mosque in September 2013, but failed after his followers halted the raid and allowed him to escape. Zarrouk is reported to have traveled to Libya before departing for Syria. “I would like to declare loud and clear, that the Al Nusrah Front, Ansar al Shariah, al Qaeda, the Islamic State of Iraq and the mujahedeen in Somalia, Mali, and Algeria, we all stand united against our enemies,” Zarrouk said, according to Al Monitor. 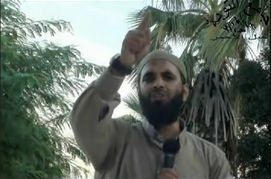 Additionally, Zarrouk is known to to have recruited youths in Tunisia to wage jihad in Syria. “Zarrouk is known in his neighborhood as someone who encouraged young people to go for jihad in Syria, which he considers to be the springboard for establishing an Islamic state from the Gulf to the ocean,” Magharebia reported. Tunisians are fighting in large numbers alongside the Al Nusrah Front, the ISIS, and other Islamist units inside Syria. More than 5,000 Tunisians are thought to have traveled to Syria to fight against President Bashir al Assad’s government. In early February, Tunisian Interior Minister Lotfi Ben Jeddou claimed that the government has prevented more than 8,000 of his countrymen from traveling to Syria to wage jihad. Jihadist groups in Syria have also featured Tunisians in their propaganda. The ISIS lauded a Tunisian suicide bomber in July 2013. That same month, the Muhajireen Army, an al Qaeda group that has ties to both the ISIS and the Al Nusrah Front and is led by Chechen commanders, released a video of a Tunisian who urged others to travel to Syria for jihad. On Jan. 10 of this year, the US added Ansar al Sharia Tunisia, along with two Ansar al Sharia groups in Libya, to its list of global terrorist organizations. Seifallah Ben Hassine, who has deep ties to al Qaeda and its top leaders, was also added as a Specially Designated Global Terrorist on the same day. The Tunisian government listed Ansar al Sharia as a terrorist group in August 2013.